Wheel alignments are some of the most profitable services offered by automotive shops. If you're looking for additional sources of revenue, this is the way to go. However, if you're using outdated equipment that works more like an adversary than an ally, then time is your true enemy. Increased service time translates to fewer vehicles serviced per day and a hard hit on your bottom line. When our deluxe turn plates are paired with our incredibly fast and accurate 3D wheel aligner, your alignment lift operations become best-in-class for many years of reliable service. Why do quality turn plates for alignment lifts matter? 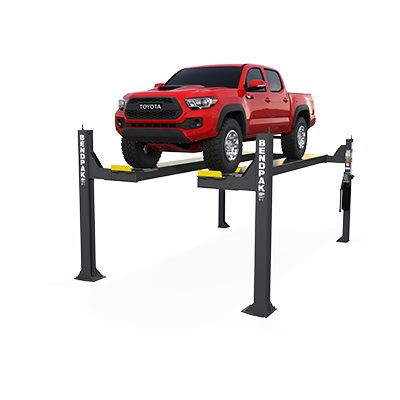 BendPak's Quatra™ alignment lift is the next evolution in industrial-strength lifting technology. 12,000 lbs. of true vertical lifting power for a more compact footprint will better accommodate smaller service bays and work areas. The XR-12000A provides you full, unobstructed vehicle access. The legendary, 14,000-lb. 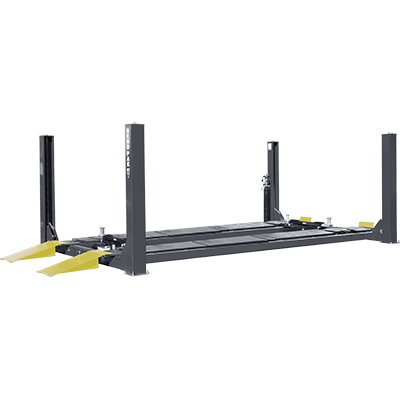 capacity HDS-14LSX alignment lift pulls double duty as both car lift and alignment system. We’ve integrated industrial-strength slip plates and turn plates right into the runways to maximize convenience. The wheels respond to every adjustment with virtually no resistance. The HDS14LSXE alignment lift is the "limo style" version of the HDS14LSX. Compared to the standard length version, this lift extends the overall length of the lift, as well as the runways, by 30". This significant increase makes it possible to load longer cars, trucks, SUVs and even some limousines. 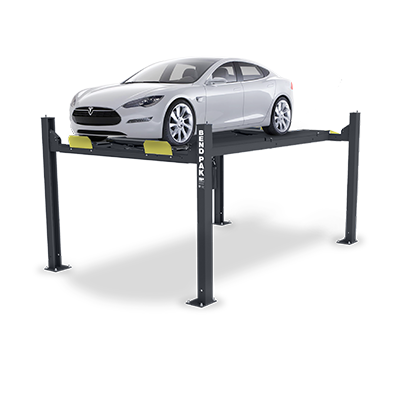 Which alignment car lift is best for my garage? BendPak's innovations in wheel alignment technology present the opportunity for shops to realize their full-profit potential with premium wheel alignment service capabilities. 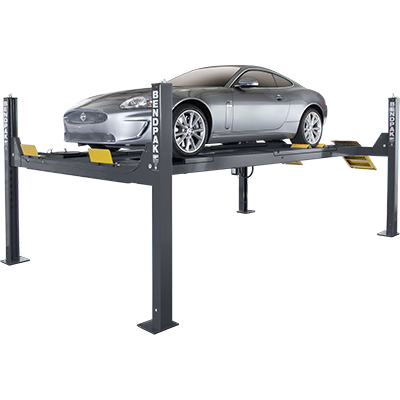 Our well-equipped four-post alignment lifts enhance productivity by simplifying the entire wheel alignment process and cutting down on the number of trips a technician must take around the vehicle. For those interested in preserving precious floor space, we developed the Quatra™ to be the ultimate space-saver. This exclusive design is so efficient that it installs into a minimum overall bay space and fits into even the most challenging shop floor layouts. With unmatched capabilities and miniscule site requirements, BendPak's advancements in wheel alignment technology combine to form the ultimate system for virtually any shop looking to expand their capabilities with the most efficient and profitable wheel alignment service available. 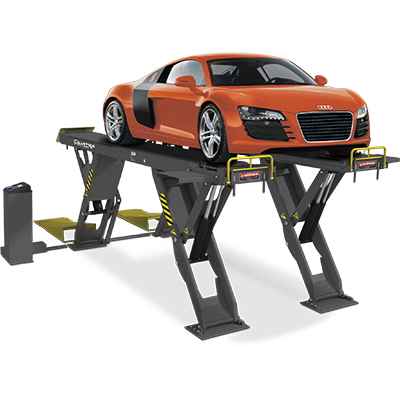 BendPak wheel alignment lifts help improve your bottom line by allowing you to perform complex wheel alignments faster than ever before. Industrial-strength slip plates and turn plates are integrated directly into the runways for maximum convenience. Vehicle wheels always respond to your slightest adjustment with our non-resistant, free-floating front turn plates, and our rear slip plates are guaranteed to maintain accuracy year after year thanks to their debris-resistant inverted caster design. 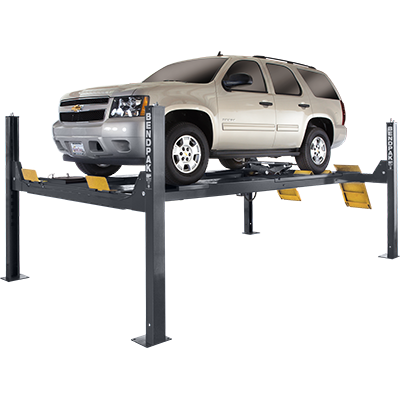 These impressive innovations have become the calling card of all BendPak alignment lifts. As with all our lift models, each one comes in a wide array of alternate configurations to perfectly suit your lifting and wheel alignment needs. 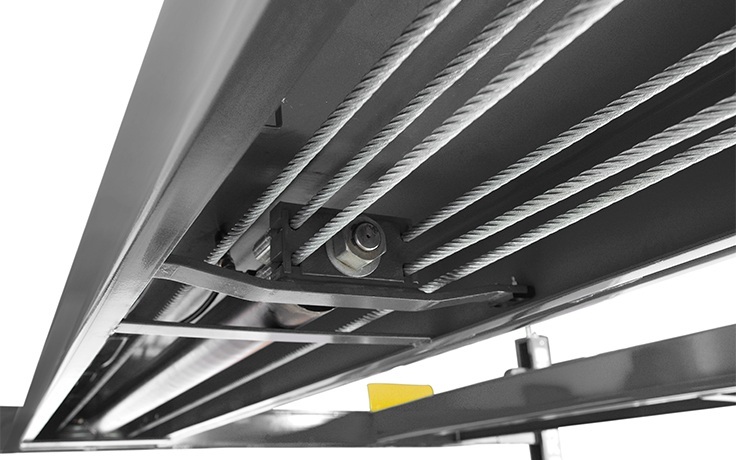 By tucking each lift’s hydraulic lifting cylinder beneath the lift platform, the only component that could threaten BendPak’s instantly recognizable and symmetrical style is cleverly hidden in a safe and discreet manner. Along with all of our cables and cable sheaves, the leak-proof hydraulic cylinder’s internal routing makes each car lift safer. By reducing exposure to the elements (you can still check underneath if you want to see the condition of the cylinder), there’s less chance of accidental damage. Part of what makes each car lift as sleek as it is efficient is the way we mask certain engineering components that would otherwise disrupt the aesthetic of the lift. To keep the hydraulic cylinder hidden on each lift, we tuck it beneath one of the drive-on ramps. This leak-proof cylinder technology is only available for BendPak four-post lifts. BendPak hydraulic cylinders feature a single-piece, pilot-fitted, machined steel piston wrapped with specially-designed, pressure-loaded U-cup piston seals, backups and wear bands that prevent fluid from bypassing back into the cylinder or from leaking out altogether. The chrome rod is machined is high-yield and incredibly smooth because we ground and polish C-1045/50 micro-alloy steel and plate it to a minimum of .001" diametrically. From our engineering efforts, you get a cylinder that won’t snap or break, no matter how often you apply the maximum weight capacity on your alignment lift. Mechanically-loaded rod seals prevent rod leakage, and an abrasion-resistant urethane rod wiper provides exclusion protection. The body of the cylinder is welded and constructed from durable steel tubing produced to meet and exceed ASTM specifications. The cylinders never rust or bend, ensuring optimum performance for many years of heavy use.